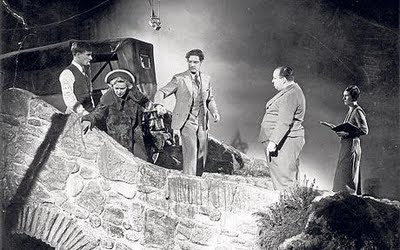 Hitchcock gives Madeleine Carroll and Robert Donat direction on the set of The 39 Steps. In The Thirty-Nine Steps (book version), Richard Hannay encounters an aspiring novelist (probably based on Buchan himself). Though the character never made it into the film, his ideas did. The young man proclaims, “I believe everything out of the common. The only thing to distrust is the normal.” That could be Hitchcock’s own dictum, who found evil simmering below the surface of even the most commonplace situations. A Midwest cornfield. A motel shower. A gently cooing flock of pigeons. Civilization’s thin crust is cracked as well in Saboteur. Think of the wealthy, cynical Charles Tobin, played by Otto Kruger. Behind his apparent U.S. patriotism, he’s actually part of a fascist conspiracy. Dripping with contempt, he says to the hero of the movie: “You're one of the ardent believers—a good American. Oh, there are millions like you. People who play along, without asking questions. I hate to use the word stupid, but it seems to be the only one that applies. The great masses, the moron millions.” Wealthy, mannered, elegant, doting grandfather -- the epitome of civilzation -- yet rotten to the core and cut from the same cloth as Professor Jordan of The 39 Steps. At the climax of Saboteur, Barry Kane (Robert Cummings) must save the enemy (Frank Frye, played by Norman Lloyd) in order to bring him to justice and clear his name. The symbolism of this location -- the top of the Statue of Liberty, of course -- ties directly into one of the film's themes that the human stain penetrates even the most sacred reaches of civilization. Want to know what happens next? Put Saboteur in your Netflix queue. And thank me later. John Buchan’s other writing got under Hitchcock’s skin. Years later, in the mid-60s, the director tried without success to resurrect Richard Hannay with a film version of another Buchan story, “The Three Hostages.” But no matter. There’s a bit of Richard Hannay in many of his heroes, from Cary Grant’s Roger Thornhill in North By Northwest to Joel McRae’s war reporter Johnny Jones in Foreign Correspondent to James Stewart’s Dr. Ben McKenna in The Man Who Knew Too Much. Professor Jordan, on the other hand, was reincarnated in the villains of Vertigo, Notorious, Foreign Correspondent and more. But Hitchcock did more than appropriate various character or plot ideas from Buchan. The two seem to have been kindred spirits when it came to thinking about how the world works. 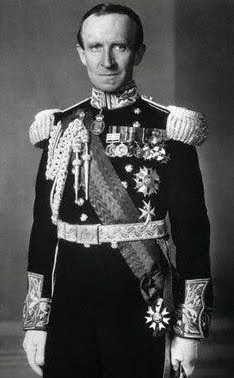 John Buchan, aka His Excellency, The Right Honourable Lord Tweedsmuir. Still, Buchan and Hitchcock shared an aesthetic sensibility. They both felt empathy for the lone modern man who tries to fight evil in a world in which 'civilization is a thin crust', and yet beautiful and well worth fighting for. F. Scott Fitzgerald believed that "the test of a first-rate intelligence is the ability to hold two opposed ideas in the mind at the same time and still retain the ability to function." If that's true, I'd say that both Buchan and Hitchcock were first-rate minds. In this subjective P.O.V. shot, Richard Hannay, aboard a Scotland-bound train and on the lam for a murder he didn't commit, reads about himself in the paper. Then he glances up to see a fellow passenger scrutinizing him. Since the man is looking directly into the camera, it's as if we feel ourselves in Hannay's skin. Throughout the film, Hitchcock keeps us closely identified with Hannay, forcing us to feel the sad, existential loneliness of a wrongly accused man on the run, foregrounding the ever present reality that, as a race of sinners, we are all doomed for the mere crime of having been born human. Alone, exposed, hunted on all sides, Richard Hannay narrowly evades a gauntlet of faceless pursuers in wide open hills of Scotland. The dark forces at work in The 39 Steps seem to be the sum of all Buchan's and Hitchcock's worst fears. Tomorrow I'm going to wrap things up with a closer look at one of my favorite scenes in The 39 Steps in which the film accomplishes more in three minutes than I did all day yesterday. Fascinating couple-- Bucan and Hitchcock, the wrong man trope.